Way too much to blog about today; where to begin?! The day started off with a long overdue 40th birthday present for my dear hubby. 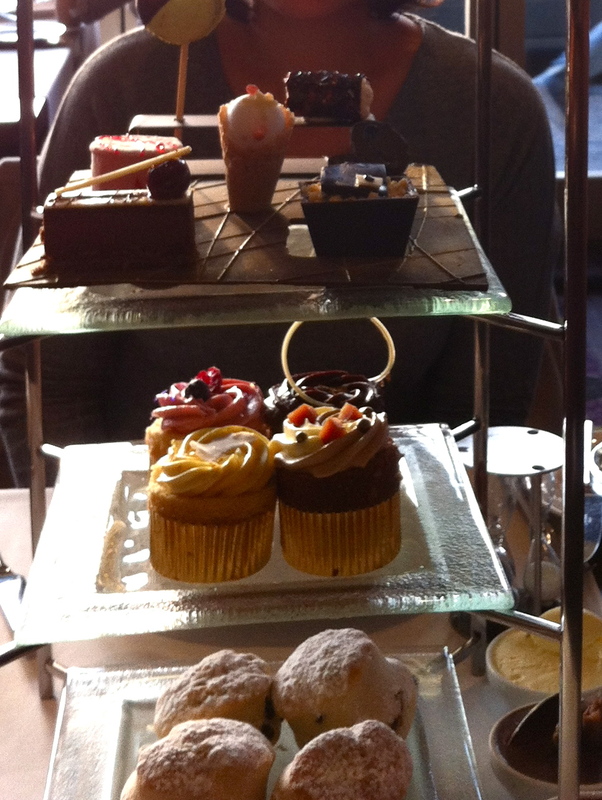 His birthday was actually in August, but it took this long to get my Living Social voucher at the Hilton, Park Lane for a massage and facial in the Purity Spa, followed by afternoon tea in the Podium at the Hilton. I haven’t got that much to say about the Purity Spa. We were quite late (Sunday traffic – grrrr), and so had to choose either the facial or hot stone massage, even though both were included in or package. (The thing I find very annoying with these sort of deals is that there is absolutely no leeway on timing, as they are so oversubscribed). In any event, I went with the hot stone massage, as my experiences with facials have been slightly hit and miss due to having incredibly sensitive skin. I haven’t had a hot stone massage before, so don’t have that much to compare it to. It basically involves very hot stones (dipped in hot water I think) being used to massage the various bits of your body. Incredibly relaxing and enjoyable, if sometimes slightly hot! The service at the Purity Spa was impeccable, although the surroundings slightly dissappointing. It is tucked away in a slightly cramped basement of the hotel, and doesn’t really live up to Hilton expectations in terms of surroundings. Checking out the usual prices at the Spa, I would say that you can get a more zen and Spa-like experience at other places in central London (I hear the spa at the Sanderson is amazing). The products used were also slightly run of the mill. Facials use Dermalogica products, so not exactly innovative. I’ve been to quite a few of the hotels along Park Lane, although this was my first visit to the Hilton. They foyer is pretty low key and unassuming, with a few touches (lighting and decor) to give it a more contemporary edge. Having said that, what you do get is impeccable service with a smile everywhere. The Podium (the venue of our afternoon tea) was pretty impressive; possibly slightly art decco-like, although that might be overstating it. Nonetheless, it’s still a pretty impressive venue, with great views of Hyde Park and the buzz of Park Lane. 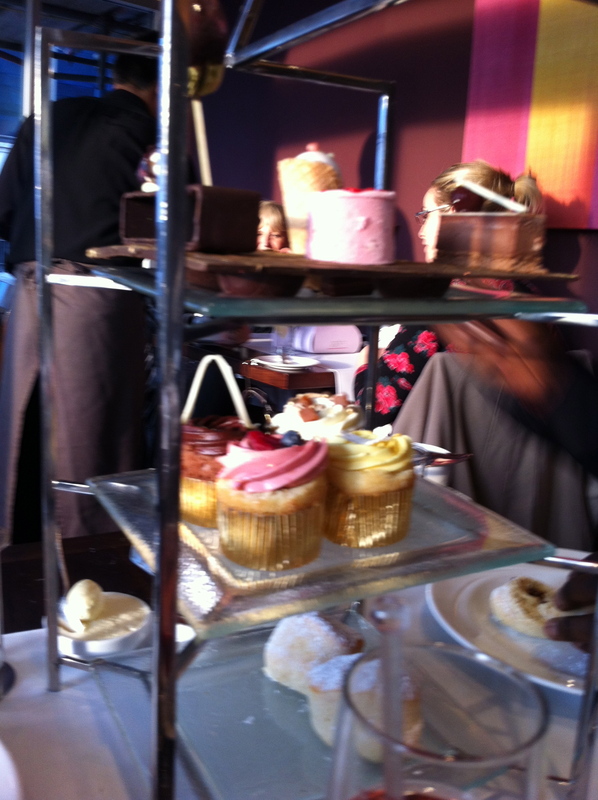 As for the afternoon tea itself. My, oh my, it certainly didn’t dissappoint, starting with open sandwiches, followed by scones (plain or with chocolate chip) accompanied by chocolate spread, as well as the usual clotted cream and jam. The base in the top tier is made entirely of chocolate, as I’ve only just found out! You get the general gist…. 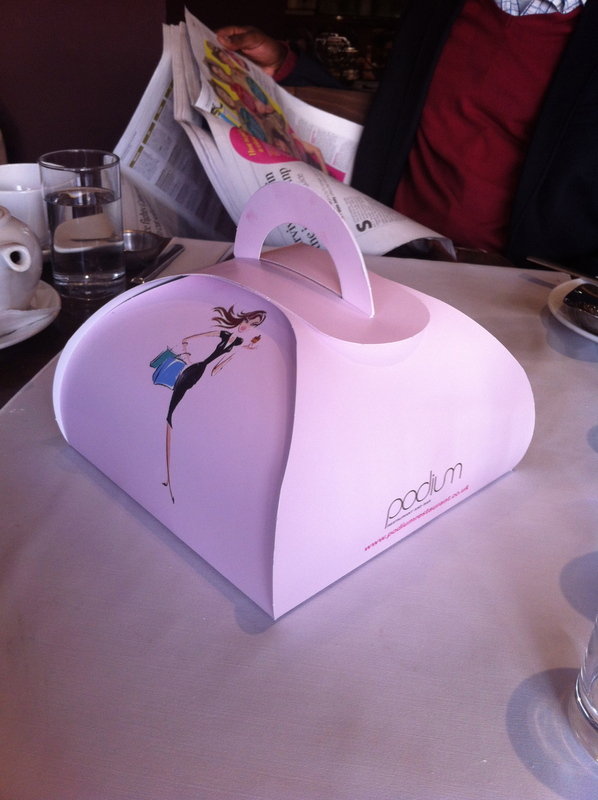 Better still, you get to take leftovers home in this gorgeous little box, which came as a bit of a relief! This is I think is pretty good value for money, given that we were both too stuffed to eat anything else for the rest of the day! Overall, I would say the Podium is worth a visit. I am no afternoon tea expert, in fact I am still ridden in guilt at the amount of clotted cream and chocolate I consumed, but I would say it compares more than favourably to other such teas I have had, at the price.